Appalachian Trail Histories | Group at Indian Gap. End of three-day hike. Group at Indian Gap. End of three-day hike. 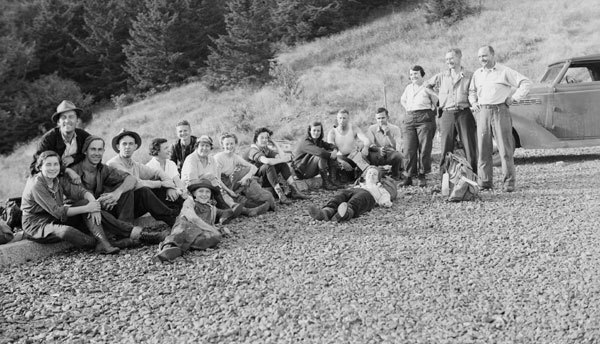 A group of hikers at Indian Gap at the end of a three-day hike, September 5, 1938. Indian Gap is the main north/south gap through the Great Smoky Mountains. Copyright (c) 2003. The University of Tennessee Libraries. All Rights Reserved. Albert Gordon (Dutch) Roth, 1890-1974, “Group at Indian Gap. End of three-day hike.,” Appalachian Trail Histories, accessed April 23, 2019, http://appalachiantrailhistory.org/items/show/470.